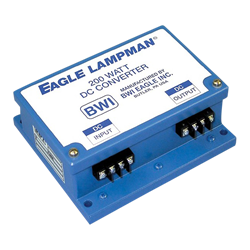 The Eagle Lampman II Power Supply is a DC to DC converter developed by BWI Eagle for 12 volt lighting systems and electronic accessories on all types of mobile equipment. Designed originally to withstand the punishing demands of the mining industry, the Eagle Lampman II is equally well-suited for virtually any industrial application requiring a rugged, reliable power supply. Incorporating advanced electronic technology and innovative circuitry design, the Lampman II sets the standard for dependable, trouble-free performance. The Lampman‘s electronics are encapsulated for protection against dust, moisture, vibration and shock, yet major components are accessible should repair be necessary. The highly regulated output allows the Lampman to drive any combination of 50 or 75 watt halogen lamps, along with on-board DC accessories, up to a total of 200 watts. To further prolong lamp life, the Lampman automatically compensates for input voltage and output load variations. Internal circuitry is protected from harm should the output cable short-circuit or become open, the Lampman automatically restarts when the short is removed and the load is applied. An integral input filter provides protection by effectively suppressing line transients before damage occurs. Rugged, reliable, cost-effective – the Lampman II is the solution for your most troublesome power supply problems.